I will never get tired of salads. Does anyone relate to that? I just love them for lunch or as light dinner that is put together in no time. 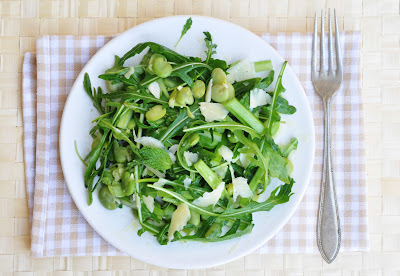 Fava Beans with Arugula and Parmesan. Imagine deliciously sweet Fava beans meeting bitter arugula and salty Parmesan rounded up with some olive oil and lemon juice. It will get you to taste heaven. I promise. I fell in love with this one immediately. In fact, it has become one of my favorite post-marathon training meals, as Fava beans have a pretty high Glycemic Index (which means that sugars will be available quickly to help restore my torn muscles). But Fava beans are just one part of the salad. After long runs of more than an hour my stomach is quite sensitive. Although I feel hungry, heavy foods would just leave me with stomach cramps. This salad has beans in it, but it is still very light. It contains raw and light celery sticks, some green leaves and Parmesan. Just the right combination to fill a “wannabe marathoner’s” tummy without upsetting it. Cook the fava beans in boiling salted water for 1-2 minutes. Drain and rinse. When they are cool enough to handle, pop them out of their shells. Set aside. Cut the celery into match sticks about 1 inch long. In a large serving bowl, combine celery, arugula, mint leaves, and cooked and shelled beans. In a small bowl, combine olive oil and lemon juice. Season with salt and pepper. Whisk until the mixture begins to thicken. Pour dressing over the salad and toss. Garnish with shaved Parmesan cheese. Serve immediately.